I really WANTED to like this issue, and the story, given Priest‘s the writer and I’ve thoroughly enjoyed other stuff he’s done. But particularly for this final chapter, I’m just left rather underwhelmed. 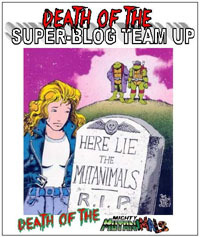 We basically pick up with the pieces from the first couple chapters of this Return of the Hero story, and a mashup of scenes ultimately results in defeat of the enemy, and the group(s) making up with Triumph, some subplots touched on for later, and finally the Zero Hour final-week fade-out to white. 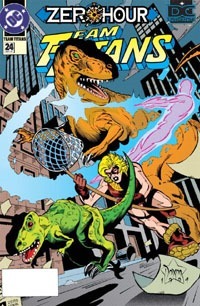 I suppose this simply was a product of its time, to say nothing of having the FEEL of a random "filler" story thrown in to bridge whatever had come before and whatever was coming next, providing some filler story that could tie in to "time travel/time anomalies" and serve as the three Justice League titles’ entries in the Zero Hour event. The story in and of itself isn’t horrible or anything, but just isn’t much to my taste; perhaps largely for being in the middle of a major "blind spot" for me with the League and the characters involved–this is not the Justice League that was "current" in 1992 tying into the Death of Superman, nor is it the Morrison-era League from when I branched out more in the later ’90s. The art also isn’t bad, but it doesn’t blow me away, either. It fits the story, and has the "feel" of the era. Perhaps there’s more depth to be found, but I’m reading from the perspective of "just read and enjoy the entirety of Zero Hour." From that angle, this is filler that fits better than a lot (it involves time anomalies) but doesn’t really seem to directly affect anything with the "core" Zero Hour story itself and so is ultimately passable. I would not recommend this issue by itself as a sole, single issue…but if you can find all three chapters of Return of the Hero! in the 25-cent/50-cent bins and you’re interested in a Priest-written Justice League story set firmly within its 1994 context, this’d be worthwhile enough. All in all, I’m ready to move on, and have actually kinda burned myself out on these such that it’s getting to be a bit of a slog to get through all these tie-ins…especially as I’m itching to get to Zero Hour #0 itself. The rise of the NEW Justice League, what the Martian Manhunter’s been up to, a bit of magic, and the origin of Booster Gold (from the JLA’s archives). 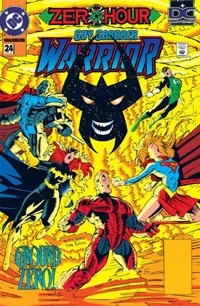 This issue basically serves to introduce us to the "new" Justice League that’s forming in the absense of the big guns. We also get to see what the Martian Manhunter’s been up to the last few months, and the continuing development of the Ralph/helmet plot. This issue’s art by Jimenez is great overall, capturing a detailed, clear look at the events of the story and its characters. The bottom-right panel of the first page with Ollie is possibly the best I’ve seen the character look in recent memory (granted, I don’t read the character’s solo title). The visuals just seem to click in this issue, and aside from the occasional apparent shift (go from that panel with Ollie to the 3rd page and compare it visually to Firehawk’s cape/wings/whatever to get what I mean) is very much up there in my list of well-done art that is cool to look at in itself rather than "merely" as a vehicle to suggest imagery for the story being told. The story itself here runs true-to-form of late for this title…rather than a couple pages here and there for a bunch of simultaneous plots, the core of the issue ("episode," if you want to use the tv analogy) focuses on Firestorm’s Justice League forming (they’re working to recruit Green Arrow as this issue opens), chronicles their first big battle, and sets the stage for events to come. In a way, the plot of the issue is largely simplistic–nothing too terribly deep–but it shows development of events as well as the characters (Firestorm–THIS Firestorm–pulling together a Justice League? Skeets back? Citizen recipients of Luthor’s metahuman treatment springing into action?) Components just fall into place believably, and I think we’re really beginning to see payoff from the foundation the earlier issues worked to lay. While we don’t see MUCH of the "usual" cast, we continue to see the interactions between the DCU characters active during this year. Though just a couple pages, the Black Adam Family scene would hold very little resonance had we not seen the development of things with Black Adam himself the last 5-6 months, nor the last several months’ development with Isis, and so on. Following this series from the beginning allows for that deeper "getting" of the overall story…but it by no means excludes one from reading this issue in particular. Even if you’re not following this series, I highly recommend this issue, for the Justice League stuff alone. 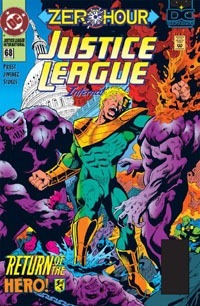 The closest I came to "discovering" the classic Giffen League initially back in the early 90s was the Doomsday issue. I would love to see a title starring an incarnation such as we see here; I find this League’s story more interesting at the moment than the ‘core’ version with its own title now. I’m still not terribly thrilled with these origin segments, but growing used to them (as opposed to the initial disappointment of the format), this one’s pretty good. The art’s quite good–I really like Jurgens‘ visuals–and I actually learned something from it. (I suppose that’s another dissatisfaction with other issues’ origins: when it’s a character whose background I’m already quite familiar with, seeing such a boiled-down version is disappointing). I might’ve said it in an earlier review, but I’ll reiterate it now (and likely again in coming months): I think that while these make for an ok backup feature, I’d rather see a single "special" or one-shot that contained a bunch of these, and get a couple more story-pages per issue in their place.